Jens Kehlet Nørskov is a former Center of Excellence director at the Technical University of Denmark (DTU) and internationally recognized for his research within catalysis and sustainable energy. 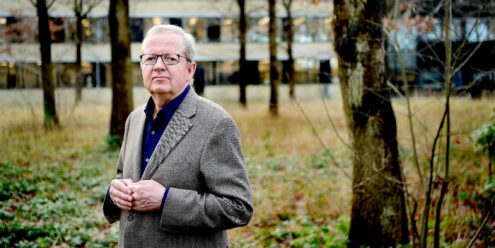 Now, after more than seven years at Stanford University, in the US, Nørskov returns to his roots as head of a major energy research initiative at DTU. Leading energy researcher and former head of a DNRF center Jens Kehlet Nørskov will return to DTU and Denmark this summer after several years as a professor and center director at the prestigious Stanford University, in the US. A 28 million DKK grant from the Villum Foundation has made it possible to create a professorship at DTU for Nørskov, who will be leading a major energy research initiative. Nørskov is famous for his research within theoretical catalysis, which refers to the technology used to control chemical processes. He has notably excelled in the development of sustainable methods and technologies related to the production of energy and fuel, an area that will be his continued focus at DTU. “The problem is that today we don’t have catalysts effective enough to convert solar energy into fuels. We need completely new types of materials that can catalyze these processes. In my research, we use quantum physical calculation methods on supercomputers to simulate the processes, and the methods are now so advanced that they can be used to design new catalytic materials,” Nørskov told the Villum Foundation. Nørskov was previously employed at DTU from 1987-2010, where he established and headed the Center for Atomic-scale Materials Physics (CAMP) from 1993-2003, funded by the Danish National Research Foundation. “There is no doubt, that my time as head of center at CAMP created a very important basis for my future career. The research center the grant allowed us to build has had enormous significance for my work since then,” Nørskov told DNRF. In 2010, he was headhunted by Stanford University to establish a new research center focusing on the development of effective catalysts. Over the course of his career, Nørskov has gained a reputation as a world-class scientist, and the Villum Foundation is very pleased to bring him home to Denmark and DTU. “We rarely give this type of grant, and only when the opportunity arises to attract an extraordinary researcher to a Danish university. Jens Kehlet Nørskov already has an impressive scientific track record, and we are convinced that Jens can continue his excellent research and develop a permanent research environment at DTU that will produce world-class results for many years to come,” said Jens Kann-Rasmussen, chair of the Villum Foundation. The energy research initiative at DTU will include the establishment of a new center for theoretical catalysis headed by Jens Nørskov. The center will cooperate with Stanford University and will be anchored at the institutes of DTU Chemistry, DTU Energy, and DTU Physics. The Center for Theoretical Catalysis will share an institute with the Center for Macroscopic Quantum States (BigQ), a newly opened DNRF Center of Excellence at DTU Physics. At BigQ, center director Ulrik Lund Andersen will explore the boundaries between classical physics and quantum physics. Read more about BigQ and Ulrik Lund Andersen here.